We live in an era of profound and rapid changes, in a breaking point° in the evolution of the Market: a Disruption Age° in which the Business Models are radically transformed (strategies, structures, etc.). In order to effectively face this market phase, it is necessary to develop strategies able to correctly interpret the new Demand°, ie it is necessary to develop a Disruptive innovation°. (a true change of the Paradigm! – of mindset and of business structures). is out of the market. The problem – which led to the current recession – is that most of the Business Players, in a moment of discontinuity of the linear evolution of the Market, continue to use a “linear mindset”, trying to protect their current status quo, without realizing that disruptive change is not an option. ● because it changes the needs of people, who, due to both new problems that they encounter on a social level; and to new expectations stimulated by the new ICT and Iot tools. ● today, people’s needs are no longer an optional factor (until today the Market has developed products that do not meet real needs, but induce the Consumer to purchase on the basis of ephemeral emotional reasons): today, the Customer is no longer able (because of the recession) to spend the money they could spend earlier to buy products that do not substantially meet essential needs. ● disruptive innovation is based primarily on the human factor: the need for a change in the relationship between the business and the Demand leads to the need to focus on the real needs of the customer (material and psychological), developing a real Sustainability° (today we have lost the concept of real sustainability, which has been replaced by an ideological concept that does not bring a real benefit for the Customer, either immediately or in the future). ● disruptive innovation, is not a technological evolution: due to the unavoidable emergence of the New Demand°, the development of new technologies becomes practically irrelevant. 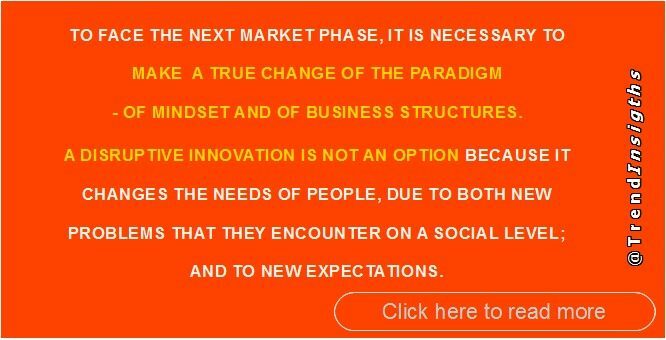 This is due to the need, in order to be able to adapt to the new Demand, to develop Useful Value° (it is necessary to develop a New Marketing° based on Value-oriented innovation°), able to lead to the creation of a Crowdsourcing Innovation°. There is obviously a link between what will happen in the Market and the issues of Government, because our Market system is currently based on a strong integration between the Big Players and the Rulers.